Stepping into conversations about sexuality may give you pause. There is a reason most Christians tend to avoid these topics. Beneath our silence about sexuality lurks a deep fear. What if our questions somehow prove that our traditional beliefs about marriage are wrong? What if a woman’s horrific testimony of abuse somehow disproves our assurance of God’s sovereignty and love? What if being honest about the level of sexual addiction in the church proves the lack of the Holy Spirit to transform lives? What if God asks you to confront your own sexual shame or brokenness? I used to be afraid of these things. My fears made me nervous about being asked a question I wasn’t certain God could answer or about stepping into waves of pain that might be too great for me to calm. Shortly before God called me to start the ministry of Authentic Intimacy with my friend Linda Dillow, He confronted me about my fear. If God is who He claims to be, there is no evidence, no question, no experience, no secret in my own life that can dismantle His absolute power, love, and sovereignty. Honoring the Lord means, by faith, pressing into all that He is with great confidence. With that assurance we can ask any question, turn over every rock, and expose every mess without fear. 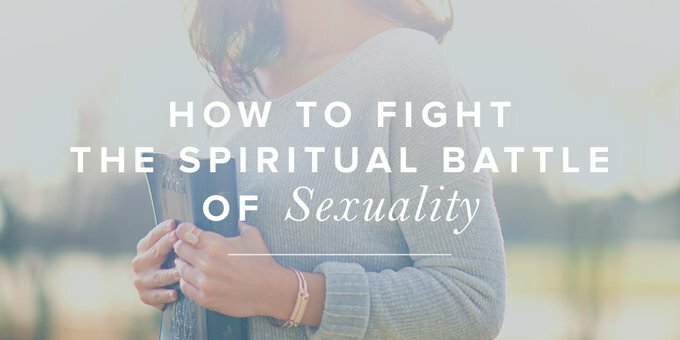 My friend, sexuality is a spiritual battle we have been losing. We have been losing it personally, we have been losing it within the Church, and we have been losing it within our culture. Yet the Bible tells us that we are more than conquerors through Christ Jesus. God has promised us victory over both the world and sin. Why are we losing? Because we don’t know how to fight. The people and ministries that are addressing Christian sexuality typically feel isolated and disconnected from the whole Body of Christ. Their efforts seem insignificant compared with the massive, orchestrated efforts of the culture. As a result, it seems as if we have conceded the area of sexuality to the world’s persuasive arguments and seductive philosophy. What would happen if Christian leaders and the Christian community were committed to defining, living, and passing on a godly sexual worldview? What if several times a day Christ-followers were given positive messages and examples of God’s beautiful design? What if the Christian community became known as the place to voice sexual questions, struggles, and failures? “Hear, O Israel: The LORD our God, the LORD is one. You shall love the LORD your God with all your heart and with all your soul and with all your might. And these words that I command you today shall be on your heart. You shall teach them diligently to your children, and shall talk of them when you sit in your house, and when you walk by the way, and when you lie down, and when you rise. You shall bind them as a sign on your hand, and they shall be as frontlets between your eyes. You shall write them on the doorposts of your house and on your gates” (Deut. 6:4–9). Clearly understanding what we believe based on God’s authority. Integrating those beliefs into our lives daily. Teaching and modeling what it looks like to walk according to God’s commands. My book Rethinking Sexuality: God’s Design and Why It Matters unpacks the above model of sexual discipleship, presenting a road map to equip every church and every Christian with the unifying message of God’s Truth and healing. It’s time to rethink sexuality. It’s time to stand on God’s power and His Truth. It’s time to reclaim sexuality as a holy expression of God’s goodness and love. It’s time for sexual discipleship. What are your biggest challenges when it comes to engaging with the tough topic of sexuality? Leave your thoughts in the comment section below. This post was adapted from Dr. Slattery’s new book on sexual discipleship, Rethinking Sexuality, where she goes in-depth on how to fight this battle. Remember, you can request a copy for yourself (or a friend) this month when you give a gift of any amount to support Revive Our Hearts and the True Woman blog. Dr. Juli is a widely known clinical psychologist, author, speaker, and broadcast media professional who loves the Lord with all her heart. After co-hosting Focus on the Family's international radio and television outreaches for several years, she joined Linda Dillow in founding Authentic Intimacy. She and her husband Mike have been married for almost two decades. They are raising their three boys in Colorado Springs where Juli can be found playing in the mountains and trying to manage her addiction to soy lattes.